For other uses, see Rur (disambiguation). R.U.R. is a 1920 science fiction play by the Czech writer Karel Čapek. R.U.R. stands for Rossumovi Univerzální Roboti (Rossum's Universal Robots). 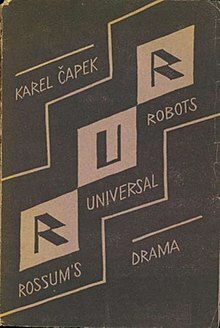 However, the English phrase "Rossum's Universal Robots" had been used as the subtitle in the Czech original. 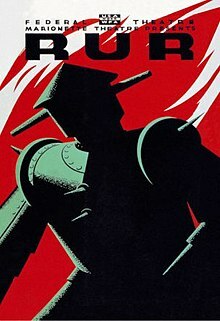 It premiered on 25 January 1921 and introduced the word "robot" to the English language and to science fiction as a whole. R.U.R. quickly became influential after its publication. By 1923, it had been translated into thirty languages. The play begins in a factory that makes artificial people, called roboti (robots), from synthetic organic matter. They are not exactly robots by the current definition of the term: they are living flesh and blood creatures rather than machinery and are closer to the modern idea of androids or replicants. They may be mistaken for humans and can think for themselves. They seem happy to work for humans at first, but a robot rebellion leads to the extinction of the human race. Čapek later took a different approach to the same theme in War with the Newts, in which non-humans become a servant class in human society. R.U.R. is dark but not without hope, and was successful in its time in Europe and North America. Parentheses indicate differences in translations. Harry Domin (Domain): General Manager, R.U.R. Dr. Gall: Head of the Physiological Department, R.U.R. Jacob Berman (Busman): Managing Director, R.U.R. Alquist: Clerk of the Works, R.U.R. 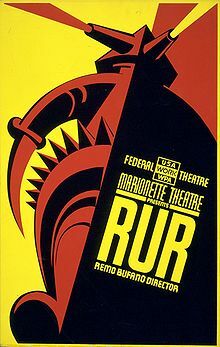 Poster for a Federal Theatre Project production of R.U.R. directed by Remo Bufano in New York, 1939. In 1920, a man named Rossum came to the island to study marine biology, and in 1932 he accidentally discovered a chemical that behaved exactly like protoplasm, except that it did not mind being knocked around. Rossum attempted to make a dog and a man, but failed. His nephew came to see him, and the two argued non-stop, largely because Old Rossum only wanted to create animals to prove that not only was God unnecessary but that there was no God at all, and Young Rossum only wanted to make himself rich. Eventually, Young Rossum locked his uncle in a laboratory to play with his monsters and mutants, while Young Rossum built factories and cranked out Robots by the thousands. By the time the play takes place – around the year 2000 – Robots are cheap and available all over the world. They have become absolutely necessary because they allow products to be made at a fifth the previous cost. Helena meets Fabry, Dr. Gall, Alquist, Busman, and Hallemeier, and reveals she is a representative of the League of Humanity, a human rights organization that wishes to "free" the Robots. The managers of the factory find this a ridiculous proposition, since they see Robots as appliances. Helena requests that the Robots be paid so that they can buy things they like, but the Robots do not like anything. Helena is eventually convinced that the League of Humanity is a waste of money, but continues to argue on the fact that robots should still have a "soul". Later, Domin confesses that he loves Helena and forces her into an engagement. Ten years later, Helena and her nurse Nana are talking about current events—particularly the decline in human births. Helena and Domin reminisce about the day they met and summarize the last ten years of world history, which has been shaped by the new worldwide Robot-based economy. Helena meets Dr. Gall's new Robot experiment, Radius, and Dr. Gall describes his experimental Robotess, Robot Helena. Both are more advanced, fully featured versions. In secret, Helena burns the formula required to create Robots. The revolt of the Robots reaches Rossum's island as the act ends. The characters sense that the very universality of the Robots presents a danger. Reminiscent of the Tower of Babel, the characters discuss whether creating national Robots who were unable to communicate beyond their language group would have been a good idea. As Robot forces lay siege to the factory, Helena reveals she has burned the formula necessary to make new robots. The characters lament the end of humanity and defend their actions, despite the fact that their imminent deaths are a direct result of those actions. Busman is killed attempting to negotiate a peace with the Robots, who then storm the factory and kill all the humans except for Alquist, the company's chief engineer, whom the Robots spare because they recognize that "he works with his hands like the Robots." Years have passed and almost all humans had been killed by the robot revolution except for Alquist. He has been attempting to recreate the formula that Helena destroyed, although as he is a mechanical engineer with insufficient knowledge of biological chemistry he has made little progress. The robot government has attempted to search for surviving humans to help Alquist but they have not been able to find any. Officials from the robot government approach Alquist and first order and then beg him to complete the formula, even if it means he will have to kill and dissect other Robots to do so. Alquist yields, agreeing to kill and dissect, which completes the circle of violence begun in Act Two. Alquist is disgusted by it. Robots Primus and Helena develop human feelings and fall in love. Playing a hunch, Alquist threatens to dissect Primus and then Helena; each begs him to take him- or herself and spare the other. Alquist realizes that they are the new Adam and Eve, and gives charge of the world to them. U.S. WPA Federal Theatre Project poster for the production by the Marionette Theatre, New York, 1939. DOMIN: Sulla, let Miss Glory have a look at you. HELENA: (stands and offers her hand) Pleased to meet you. It must be very hard for you out here, cut off from the rest of the world. SULLA: I do not know the rest of the world Miss Glory. Please sit down. SULLA: From here, the factory. In a limited sense, they resemble more modern conceptions of man-made life forms, such as the Replicants in Blade Runner, the "hosts" in the Westworld TV series and the humanoid Cylons in the re-imagined Battlestar Galactica, but in Čapek's time there was no conception of modern genetic engineering (DNA's role in heredity was not confirmed until 1952). There are descriptions of kneading-troughs for robot skin, great vats for liver and brains, and a factory for producing bones. Nerve fibers, arteries, and intestines are spun on factory bobbins, while the Robots themselves are assembled like automobiles. Čapek's robots are living biological beings, but they are still assembled, as opposed to grown or born. One critic has described Čapek's Robots as epitomizing "the traumatic transformation of modern society by the First World War and the Fordist assembly line." 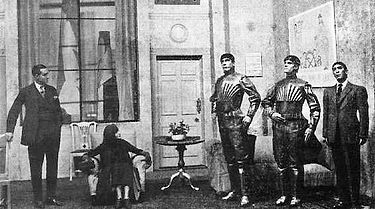 The play introduced the word robot, which displaced older words such as "automaton" or "android" in languages around the world. In an article in Lidové noviny Karel Čapek named his brother Josef as the true inventor of the word. In Czech, robota means forced labour of the kind that serfs had to perform on their masters' lands and is derived from rab, meaning "slave". The name Rossum is an allusion to the Czech word rozum, meaning "reason", "wisdom", "intellect" or "common sense". It has been suggested that the allusion might be preserved by translating "Rossum" as "Reason" but only the Majer/Porter version translates the word as "Reason". Cover of the first edition of the play designed by Josef Čapek, Aventinum, Prague, 1920. The work was published in Prague by Aventinum in 1920 and premiered in that city on 25 January 1921. It was translated from Czech into English by Paul Selver and adapted for the English stage by Nigel Playfair in 1923. Selver's translation abridged the play and eliminated a character, a robot named "Damon". In April 1923 Basil Dean produced R.U.R. for the Reandean Company at St Martin's Theatre, London. The American première was at the Garrick Theatre in New York City in October 1922, where it ran for 184 performances, a production in which Spencer Tracy and Pat O'Brien played robots in their Broadway debuts. It also played in Chicago and Los Angeles during 1923. In the late 1930s, the play was staged in the U.S. by the Federal Theatre Project's Marionette Theatre in New York. In 1989, a new, unabridged translation by Claudia Novack-Jones restored the elements of the play eliminated by Selver. Another unabridged translation was produced by Peter Majer and Cathy Porter for Methuen Drama in 1999. Reviewing the New York production of R.U.R., The Forum magazine described the play as "thought-provoking" and "a highly original thriller". John Clute has lauded R.U.R. as "a play of exorbitant wit and almost demonic energy" and lists the play as one of the "classic titles" of inter-war science fiction. Luciano Floridi has described the play thus: "Philosophically rich and controversial, R.U.R. was unanimously acknowledged as a masterpiece from its first appearance, and has become a classic of technologically dystopian literature." Jarka M. Burien called R.U.R. a "theatrically effective, prototypal sci-fi melodrama". On the other hand, Isaac Asimov, author of the Robot series of books and creator of the Three Laws of Robotics, stated: "Capek's play is, in my own opinion, a terribly bad one, but it is immortal for that one word. It contributed the word 'robot' not only to English but, through English, to all the languages in which science fiction is now written." In fact, Asimov's "Laws of Robotics" are specifically and explicitly designed to prevent the kind of situation depicted in R.U.R. – since Asimov's Robots are created with a built-in total inhibition against harming human beings or disobeying them. On April 17, 1935, a film adaptation of R.U.R. debuted in the Soviet Union entitled Gibel Sensatsii ("Loss of Sensation"). It was directed by Alexandr Andriyevsky. All the robots in the film prominently display the name "R.U.R. ", though the film does take liberties with the original plot by tailoring it to communist propaganda. On 11 February 1938, a thirty-five-minute adaptation of a section of the play was broadcast on BBC Television – the first piece of television science-fiction ever to be broadcast. In 1941 BBC radio presented a radio play version, and in 1948, another television adaptation – this time of the entire play, running to ninety minutes – was screened by the BBC. In this version, Radius was played by Patrick Troughton who was later the second actor to play The Doctor in Doctor Who. None of these three productions survives in the BBC's archives. BBC Radio 3 dramatised the play again in 1989, and this version has been released commercially. The Hollywood Theater of the Ear dramatized an unabridged audio version of R.U.R. which is available on the collection 2000x: Tales of the Next Millennia. In August 2010, Portuguese multi-media artist Leonel Moura's R.U.R. : The Birth of the Robot, inspired by the Capek play, was performed at Itaú Cultural in São Paulo, Brazil. It utilized actual robots on stage interacting with the human actors. An electro-rock musical, Save The Robots is based on R.U.R., featuring the music of the New York City pop-punk art-rock band Hagatha. This version with book and adaptation by E. Ether, music by Rob Susman, and lyrics by Clark Render was an official selection of the 2014 New York Musical Theatre Festival season. On 26 November 2015 The RUR-Play: Prologue, the world's first version of R.U.R. with robots appearing in all the roles, was presented during the robot performance festival of Cafe Neu Romance at the gallery of the National Library of Technology in Prague, Czech Republic. The concept and initiative for the play came from Christian Gjørret, the leader of "Vive Les Robots! ", who on 29 January 2012, during a meeting with Steven Canvin of LEGO Group, presented the proposal for Lego to support the play with their LEGO MINDSTORMS robot kit. On 29 April 2015 the Czech R.U.R. team, which consisted primarily of high school students from Gymnazium Jesenik began to develop the play. Paul Selver and Nigel Playfair's 1923 translation was used and the members of the team provided the voices. The play was directed by Filip Worm and the full realization was led by Roman Chasák. Eric, a robot constructed in Britain in 1928 for public appearances, bore the letters "R.U.R." across its chest. In the American science fiction television series Dollhouse, the antagonist corporation, Rossum Corp., is named after the play. In the Star Trek episode "Requiem for Methuselah", the android's name is Rayna Kapec (an anagram, though not a homophone, of Capek, Čapek without its háček). In Batman: The Animated Series, the scientist that created the HARDAC machine is named Karl Rossum. HARDAC created mechanical replicants to replace existing humans, with the ultimate goal of replacing all humans. One of the robots is seen driving a car with "RUR" as the license plate number. In the 1977 Doctor Who serial "The Robots of Death", the robot servants turn on their human masters under the influence of an individual named Taren Capel. In the 1995 science fiction series The Outer Limits, in the remake of the "I, Robot" episode from the original 1964 series, the business where the robot Adam Link is built is named "Rossum Hall Robotics". The 1999 Blake's 7 radio play The Syndeton Experiment included a character named Dr. Rossum who turned humans into robots. In the "Fear of a Bot Planet" episode of the animated science fiction TV series Futurama, the Planet Express crew is ordered to make a delivery on a planet called "Chapek 9", which is inhabited solely by robots. In Howard Chaykin's Time² graphic novels, Rossum's Universal Robots is a powerful corporation and maker of robots. In Spacehunter: Adventures in the Forbidden Zone, when Wolff wakes Chalmers, she has been reading a copy of R.U.R. in her bed. This presages the fact that she is later revealed to be an android. In the 2016 video game Deus Ex: Mankind Divided, R.U.R. is performed in an underground theater in a dystopian Prague by an "augmented" (cyborg) woman who believes herself to be the robot Helena. In the 2018 British alternative history drama Agatha and the Truth of Murder, Agatha is seen reading R.U.R. to her daughter Rosalind as a bedtime story. The Steam Man of the Prairies (1868), an early American depiction of a "mechanical man"
^ Roberts, Adam (2006). The History of Science Fiction. New York: PALGRAVE MACMILLAN. p. 168. ISBN 9780333970225. ^ Kussi, Peter. Toward the Radical Center: A Čapek Reader. (33). ^ a b Asimov, Isaac (September 1979). "The Vocabulary of Science Fiction". Asimov's Science Fiction. ^ a b Voyen Koreis. "Capek's RUR". Archived from the original on 23 December 2013. Retrieved 23 July 2013. ^ Tim Madigan (July–August 2012). "RUR or RU Ain't A Person?". Philosophy Now. Archived from the original on 3 February 2013. Retrieved 24 July 2013. ^ Charles T. Rubin (2011). "Machine Morality and Human Responsibility". The New Atlantis. Archived from the original on 26 October 2013. Retrieved 24 July 2013. ^ "Ottoman Turkish Translation of R.U.R. – Library Details" (in Turkish). Archived from the original on 3 February 2014. Retrieved 24 July 2013. ^ a b Roberts, Adam "Introduction", to RUR & War with the Newts. London, Gollancz, 2011, ISBN 0575099453 (pp. vi–ix). ^ a b Jarka M. Burien, "Čapek, Karel" in Gabrielle H. Cody, Evert Sprinchorn (eds.) The Columbia Encyclopedia of Modern Drama, Volume One. Columbia University Press, 2007. ISBN 0231144229, (pp. 224–225). ^ On the meaning of the names, see Ivan Klíma, Karel Čapek: Life and Work, 2002, p. 82. ^ Capek, Karel (2001). R.U.R.. translated by Paul Selver and Nigel Playfair. Dover Publications. p. 49. ^ a b Rieder, John "Karl Čapek" in Mark Bould (ed.) (2010) Fifty Key Figures in Science Fiction. London, Routledge. ISBN 9780415439503. pp. 47–51. ^ "Who did actually invent the word 'robot' and what does it mean?". Archived from the original on 27 July 2013. Retrieved 25 July 2013. ^ "robot". Free Online Dictionary. Archived from the original on 6 July 2013. Retrieved 25 July 2013. ^ a b Klíma, Ivan, Karel Čapek: Life and Work. Catbird Press, 2002 ISBN 0945774532 (p. 260). ^ a b Abrash, Merritt (1991). "R.U.R. Restored and Reconsidered". 32 (2). Extrapolation: 185–192. "Spencer Tracy Biography". Biography.com. Archived from the original on 8 September 2011. Retrieved 26 July 2013. Swindell, Larry. Spencer Tracy: A Biography. New American Library. pp. 40–42. ^ Butler, Sheppard (16 April 1923). "R.U.R. : A Satiric Nightmare". Chicago Daily Tribune. p. 21. ; "Rehearsals in Progress for 'R.U.R.' Opening". Los Angeles Times. 24 November 1923. p. I13. ^ Peter Kussi, ed. (1990). Toward the Radical Center: A Karel Čapek Reader. Highland Park, NJ: Catbird Press. pp. 34–109. ISBN 0945774060. ^ Roland Holt, "Plays Tender and Tough", The Forum magazine, November 1922, (pp. 970–976). ^ Clute, John (1995). Science Fiction: The Illustrated Encyclopedia. Dorling Kindersley. pp. 119, 214. ISBN 0751302023. ^ Christopher, David (31 May 2016). "Stalin's "Loss of Sensation": Subversive Impulses in Soviet Science-Fiction of the Great Terror". MOSF Journal of Science Fiction. 1 (2). ISSN 2474-0837. Archived from the original on 26 December 2016. ^ Telotte, J. P. (2008). The essential science fiction television reader. University Press of Kentucky. p. 210. ISBN 0-8131-2492-1. Archived from the original on 13 March 2017. ^ "' R.u.r. '". Radio Times. No. 938. 19 September 1941. p. 7. ISSN 0033-8060. Archived from the original on 17 February 2017. Retrieved 9 February 2018. ^ "R.U.R. (Rossum's Universal Robots)". Radio Times. No. 1272. 27 February 1948. p. 27. ISSN 0033-8060. Retrieved 9 February 2018. ^ "R.U.R. (Rossum's Universal Robots)". Internet Archive. Retrieved 9 February 2018. ^ "2000x: Tales of the Next Millennia". Archived from the original on 10 May 2013. Retrieved 29 July 2013. ^ "2000X: Tales of the Next Millennia". Amazon.com. Archived from the original on 4 July 2013. Retrieved 29 July 2013. ^ "Itaú Cultural: Emoção Art.ficial "2010 Schedule"". Retrieved 6 August 2013. ^ "Save The Robots the Musical Summary". Archived from the original on 14 July 2014. ^ "Save The Robots: NYMF Developmental Reading Series 2014". Archived from the original on 17 June 2014. Retrieved 13 June 2014. ^ "VIDEO: Poprvé bez lidí. Roboti zcela ovládli Čapkovu hru R.U.R." iDNES.cz. Archived from the original on 26 March 2016. Retrieved 19 March 2016. ^ "Entertainment Czech Republic Robots | AP Archive". www.aparchive.com. Archived from the original on 29 March 2016. Retrieved 19 March 2016. ^ Wright, Will; Kaplan, Steven. The Image of Technology in Literature, the Media, and Society: Selected Papers from the 1994 Conference [of The] Society for the Interdisciplinary Study of Social Imagery. The Society. p. 3. Archived from the original on 7 March 2017. ^ Okuda, Michael; Okuda, Denise; Mirek, Debbie (17 May 2011). The Star Trek Encyclopedia. Simon and Schuster. pp. 883–. ISBN 9781451646887. Archived from the original on 10 June 2016. Retrieved 10 February 2018. ^ Stein, Michael (20 February 2012). "Batman and Robin swoop into Prague". Česká pozice. Reuters. Retrieved 9 February 2018. ^ Cornell, Paul; Day, Martin; Topping, Keith (1995). "90 'The Robots of Death'". Doctor Who: The Discontinuity Guide. London: Doctor Who Books. p. 205. ISBN 0-426-20442-5. Archived from the original on 30 March 2017. ^ Booker, M. Keith. Drawn to Television: Prime-Time Animation from The Flintstones to Family Guy. pp. 115–124. ^ Costello, Brannon (11 October 2017). Neon Visions: The Comics of Howard Chaykin. LSU Press. p. 113. ISBN 9780807168066. Retrieved 10 February 2018. ^ Deus Ex: Mankind Divided - Strategy Guide. Gamer Guides. 30 September 2016. p. 44. ISBN 9781630413781. Retrieved 10 February 2018. Wikimedia Commons has media related to R.U.R..
Online facsimile version of the 1920 first edition in Czech. This page was last edited on 3 April 2019, at 17:08 (UTC).